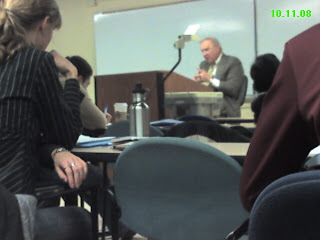 Professor Emeritus C. John Weborg, 72 years old, is lecturing on his experiences on the combination of ritual and pastor identity. When someone calls you to a death bed, do you know what to do? People need someone who knows the words. The Apostle Paul writes of apprehending what had apprehended him. [referencing Phil 3.9]. Ritual, using transrational thinking, using reflection, can sometimes help us apprehend what has apprehended us. Ritual is a system of symbols rather than mere signs. Symbols being roomy, allow many different people to put them on, so to speak, in different ways. Signs do not. Signs are unambiguous because they exist to give precise information. Symbols coax into a swamp of meaning and require one to frolic in it. Because he's retired, we get only a few guest-lecture chances to hear from John Weborg. Every time is worth it.